James is the pioneer of the Trust Technique a method of mindfulness between animals and people, that connects and heals both. This new method has a deep message of hope and understanding which gives people a simple way to help both animals and humans with this authentic gift. Shelley has a huge and unique capacity to organise and coordinate events while keeping a personal touch with all she meets. Her true passion is as a therapist, helping children and their families to find healing and understanding with the Trust Technique. Her purpose extends beyond the one-on-one therapy and into the expansion of this much needed work into larger communities. After a tragic incident in Hong Kong where James’ sister died in a boat accident, his parents came back to the UK 1972. 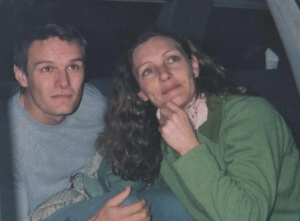 They moved to a farm in Surrey where they had dogs, horses and cats.The huge loss had put a great strain on the relationship between James’ parents. After his parents split up and his mother’s remarriage to an aggressive alcoholic, James found sanctuary with the many animals in his life. It was here that he discovered the magic of the animal-human relationship. Not because he was looking for it, but more because there was a need. It was not until a number of years later that he was to discover the significance this relationship was going to have, not only in his own life but also in the lives of many other people and animals. James describes this time in his life as being very fortunate! 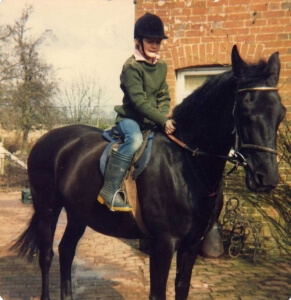 Even at the early age of 14, James was being sent horses to work with. 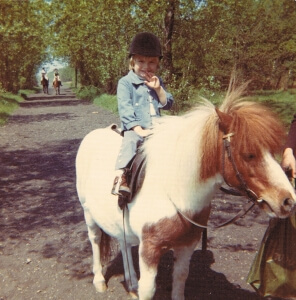 After rehabilitating his own rescued ponies, other people asked James to help their ponies and horses. This included the backing of young horses and was to become a passion and the start of a unique journey. James trained horses for jumping and was asked to join the British Juniors Jumping Team. He also trained polo ponies and was sent around the world by Kerry Packer, working for one of the top 10 goal players in the world Gonzalo Tanoira. While in Argentina he worked bringing on young horses. As much as this was a learning experience and great fun for a 20-year-old it was not the path that his heart had mapped out for him. He returned to backing young horses and adopted horse whispering techniques. But this was still not enough, he sensed that there was a better way. It was time to find the pure connection that he had with his childhood animal friendships. There was an obvious gap between what he understood as the relationship with an animal and what he was seeing in the horse industry. After finding Reiki Healing and applying this into his horse work a new understanding was opened. 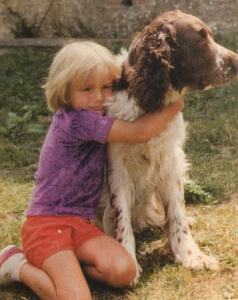 It was the feeling that most closely related back to the pure relationship with animals he had experienced as a child. 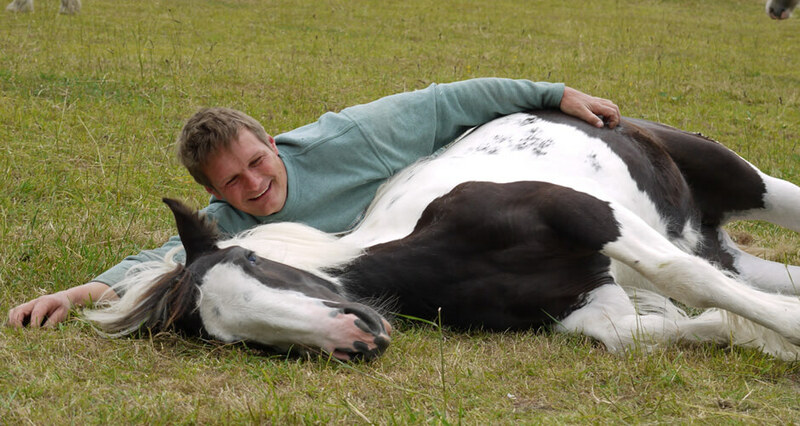 James placed Reiki directly into his horsemanship with a profound effect. James started working with many people and animals needing healing. From children with cancer to dogs with aggression. It was at this time that he realised that to truly help an animal you must also help the people. This bigger healing picture of the relationship and how animals and people interact with each other became the central part of his work.James started working with many people and animals needing healing. From children with cancer to dogs with aggression. It was at this time that he realised that to truly help an animal you must also help the people. This bigger healing picture of this relationship and how animals and people interact with each other became the central part of his work. James was starting his healing path when he met Shelley. Together they dreamed of a life of helping people and their animals. Shelley helps James to go further down the Reiki path and took the bold steps of leaving her work to join him. 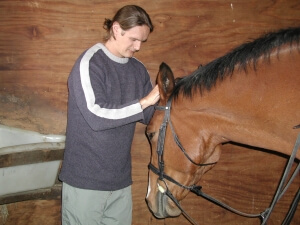 James began detailed communication with the animals that he was treating with Reiki. This ability changed his consultation and thinking patterns forever. With the help of Shelley, it was time to teach pet owners and professionals how they too could communicate on this level.The ACT1 workshop and CD Set was then born. 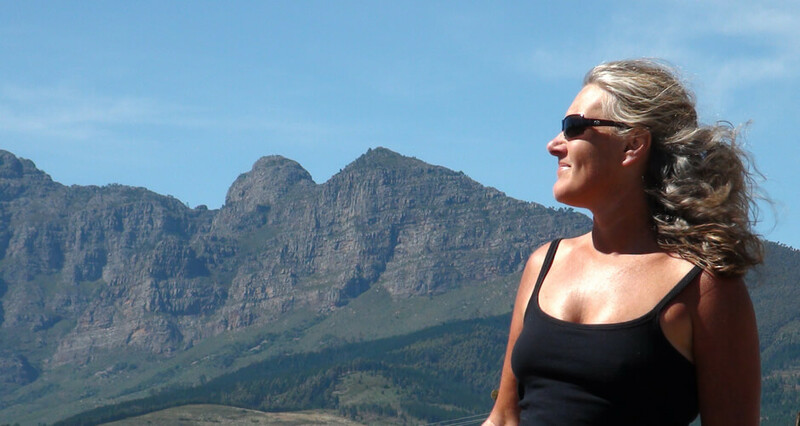 With Shelley supporting and organising the events before they knew it they were travelling and teaching the skill of animal communication to vets, behaviourists, trainers and pet owners worldwide. 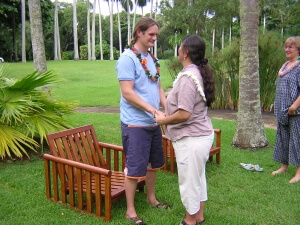 James was very fortunate to study his mastership with the lineage bearer of Reiki Phyllis Lei Furumoto and was initiated in Hawaii in the old residence of Hawayo Takata. After this five year study and initiation, James started teaching First and Second degree Reiki. It was this self-healing process that started to build the bridge between what James experienced as deep relationships with animals and the communication needed to highlight the need for more compassion in working with animals. 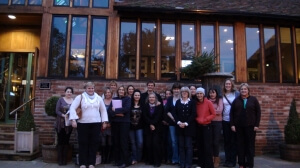 After recognising that a purposeful demand existed, James and Shelley created the ACT2 Practitioners course. People could learn these skills and go on to become independent, insured animal communicators. 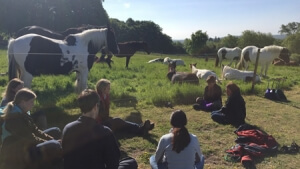 As a stand alone or combined therapy, Animal Communication Training has been paramount in the development and standardisation of much of the animal communication learning in the UK. James and Shelley offered their time free of charge to help rescue centres. James taught the staff of a number of centres the Trust Technique while working with their abused animals. They videoed all of the sessions and used them to create an online video course, so other people could access the site and learn from the help they gave to these centres. Since launching the video course, James has added his own private consultations and detailed tutorials to the collection and made this resource accessible to everyone. 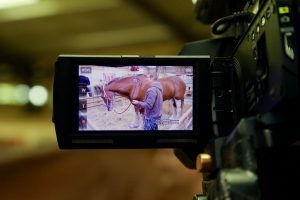 There are over 250 stunning video examples of his work with horses, dogs, cats, lions and bears. The video course is the progression of this teaching and will continue to reflect the advancement of the technique. The concept of the video course is simple. 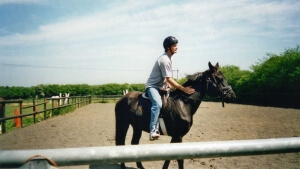 James and Shelley help the centres free of charge, the videos are placed on the course and people purchase the course which helps them with their animals and at the same time funds this valuable work worldwide. 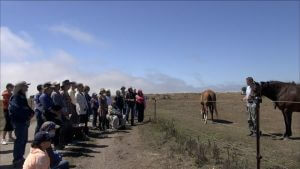 Both James and Shelley offered their services to set up the ground systems from the horses perspective of a very new sanctuary. The plan was that it was only going to be for 3 months to help their friend Jenny Seagrove. James was the interim manager for the first few months and then moved his attention to teaching. Shelley took over as the manager running the site and working with the children who visit the farm. 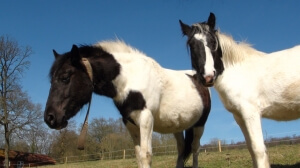 Little did they know at the time what a special place this was to become by combining rescued horses, the Trust Technique and setting up a unique healing centre for animals and humans. This turned out to be a four and a half year project, a little more than the predicted 3 months. 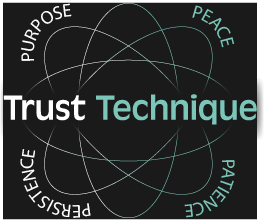 The Trust Technique Practitioner course was the natural progression for the advancement of the technique. If the method is to have an impact on how people teach animals then more people need to be involved on this deeper level. This cutting edge programme of animal care works with relationship building, healing, animal assisted healing and advanced communication. This next step of teaching practitioners charts new territory and the technique is being explored and applied in a huge arena. Practitioners support environments where animal intelligence can be seen felt and interacted with, changing human perception of animals. The courses were held in person and it soon became apparent that we could not teach the numbers who were on our waitlists, another approach was needed. The Trust Technique® is a mindful practice that is shared between the person and their animals. In simple terms, there is a sharing of peace of mind – the opposite to over- thinking. In the first stages, this connection builds a core bond of trust and confidence in each other, which can then develop and extend to other areas of their lives. When the relationship shifts from fear to trust, over-reactions are replaced with instinctual learning. This connectivity has been the main part of the healing that takes place within a consultation, between a person and their animal. This main concept has the potential to help many people changes their lives and James and Shelley created a pilot program in collaboration with Mane Chance, to help mental health with children. It was clear to see the huge potential this could have not only with children but also people suffering from emotional and physical pain. Facebook delivered this small video with a big message. Now is the time to treat animals with mindful regard. The video has a direct link where people can have a free day on the video course. The response was overwhelming. We have now given free training to over 12,000 people and have planted a seed of hope and direction worldwide to animal care. 2016 was a place of travel as we shared the teaching with the development of the I Have A Dream Day which we have taught in USA, Vietnam, Bali, Australia and the UK. 2016 was a time of travel as we shared the teaching with the development of the I Have A Dream Day which we have taught in USA, Vietnam, Bali, Australia and the UK. 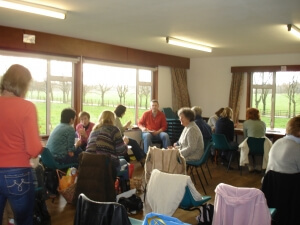 A one day workshop clearly showing all the aspects of the Trust Technique. 2017 Trust Technique Practitioner become a regulated qualification. Crossfields Institute Level 3 Diploma in Mindfulness for people with their animals: Trust Technique Practitioner. This online Level 3 Diploma regulated by Ofqual, is designed to teach you the necessary steps required to become a fully qualified Trust Technique ® Practitioner so that you can help both animals and people find confidence and trust, within a practice of mindfulness. 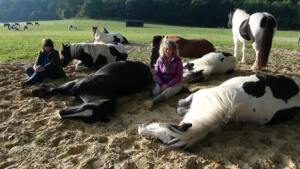 A Trust Technique® Practitioner holds a space of supporting people to work with an animal that they are responsible for. The aim is to introduce the client into a daily therapeutic practice with their animal. This means demonstrating and supporting the client in holding the present moment, delivering this to their animal and creating a deep connection between the two of them. Thus begins the process of overcoming problems for both the client and the animal. In effect, the client learns to support themselves and their animal within a practical meditational practice.